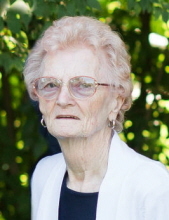 Joyce Ray (Moore) Combs, 84 of Crab Orchard passed away on Tuesday, April 2, 2019 at Landmark of Lancaster. She was the widow of Earl C. Combs who preceded her in death on January 29, 2016. Joyce was born in Wilmington, North Carolina on November 10, 1934 to the late Roscoe & Mary Carroll (Watkins) Moore. She was a member of the Beech Grove Baptist Church and enjoyed volunteering for Hospice for many years. Memorial Contributions suggested to either Heritage Hospice or The American Alzheimer's Association. To send flowers or a remembrance gift to the family of Joyce Moore Combs, please visit our Tribute Store. "Email Address" would like to share the life celebration of Joyce Moore Combs. Click on the "link" to go to share a favorite memory or leave a condolence message for the family.